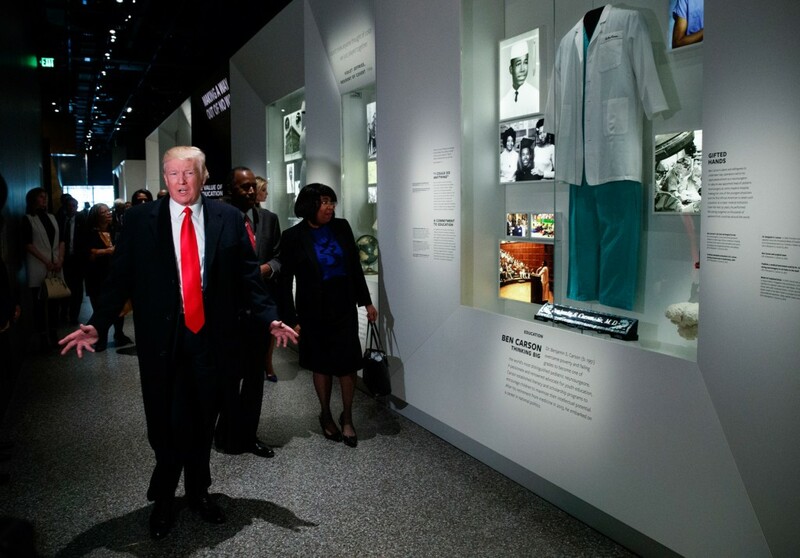 President Trump visited the Smithsonian Institution’s National Museum of African American History and Culture on February 21. “This tour was a meaningful reminder of why we have to fight bigotry, intolerance and hatred in all of its very ugly forms,” the president said. The museum includes an exhibit dedicated to Dr. Ben Carson, who was one of Trump’s rivals in the Republican presidential primary and is the president’s pick to serve as the next secretary of housing and urban development. The exhibit shows Carson’s rise from poverty to become a prominent pediatric neurosurgeon. Also on hand were Carson’s wife, Candy, the president’s daughter Ivanka and White House aide Omarosa Manigault. “I’m deeply proud that we now have a museum that honors the millions of African American men and women who built our national heritage, especially when it comes to faith, culture and the unbreakable American spirit,” the president said on Facebook. The museum, which opened in September 2016, takes visitors on a journey through the eras of slavery and segregation, the civil rights movement of the 1950s–1960s and the achievements of African Americans in all walks of life. Located on the National Mall, it houses some 34,000 artifacts. Trump’s wife, Melania, toured the museum February 15 with Sara Netanyahu, wife of Israeli Prime Minister Benjamin Netanyahu, who was in Washington at the time. February is National African American History Month. Earlier in the month, President Trump issued a proclamation to commemorate the role African Americans have played in U.S. history.